Welcome to Myoma Dunes Water Company! Myoma Dunes Water Company has provided drinking water to the Bermuda Dunes area for over 60 years since 1953. We are a small mutual water company serving approximately 2450 residents in parts of Bermuda Dunes and La Quinta area. The community is served from five company owned water wells located in the same area. They draw water from the Lower Whitewater River sub-basin of the Coachella Valley aquifer. Myoma Dunes water quality is regulated by the USEPA and the California State Water Board to ensure that tap water is safe. 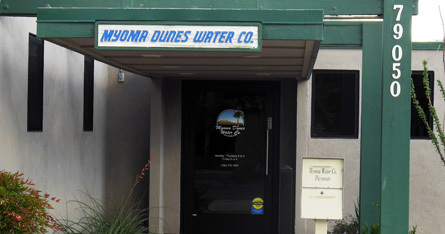 Myoma Dunes Water offices are located on the Northeast corner of Adams St and Avenue 42 in Bermuda Dunes, California. Parking access is only available from Adams Street. Our business hours are 8am-5pm/Mon.-Thurs and 8am-4pm on Friday. Property owners may sign up for water service by completing a service application. The owner may apply in person at the Myoma Dunes Water Company office or by telephone. Do we have your correct contact information? Please let us know if we can update your mailing address, email address or contact phone number. And stay tuned for sign up for direct access to your account coming soon. In our hot desert environment, it is important to remember that as much as 70% of the water you use can go towards watering your landscaping. The key is to apply just enough water for optimal plant growth and health, without over watering. SaveourH20.org and cvwatercounts.com has information on landscape watering tips.